This city, the capital of the province of Santa Fe, has 490.000 inhabitants (including the greater Santa Fe area) and is the seat of the provincial government. It is an important commercial and farming center. 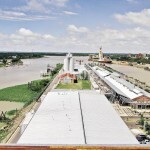 It is in the middle of a rich farming region and it is the main milk producing area in the country (and one of the most important in the world) that extends into the east of the province of Córdoba. Served by the Belgrano railway, it is thus connected with the north, northwest, Bolivia, Chile and the city of Buenos Aires south. The road network is important: a tunnel under the river connects Santa Fe to Mesopotamia region, Brazil, Paraguay and Uruguay; to the west it is connected with the Pampa region, and other destinations such as Coquimbo and Valparaíso in Chile. Towards the north there are alternatives to reach Bolivia and Paraguay and towards the south it connects via freeway with Rosario and Buenos Aires. In the nearby is a domestic airport and 160km away there is an international airport at Rosario. 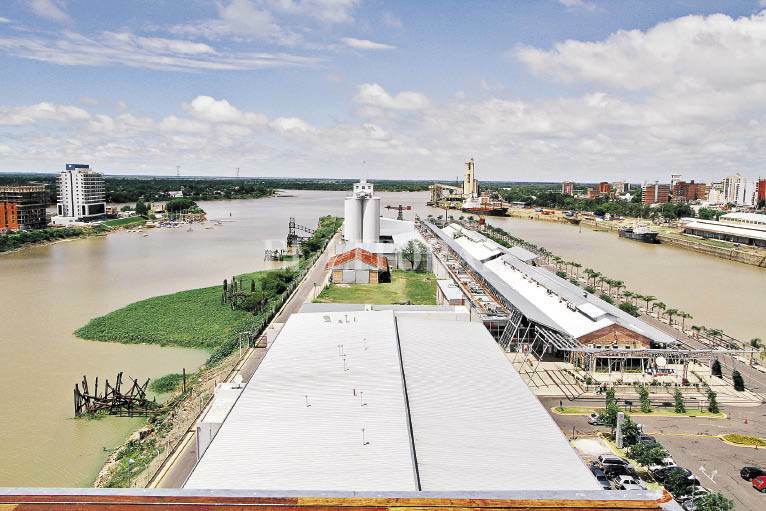 Due to a progressive embankment on the access channel (no dredging done during the past few years), this port no longer operates with ocean going vessels; while draft restrictions in the access channel between Km 586,4 and Km 588,4 and at the elevator Nº 1 berth, with depths of 6,70 m (22′) or less, the port actually is shifting mainly to reefer and barge operations. 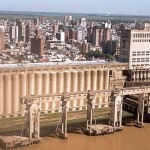 There are studies underway to construct a grain terminal at Parana river Km 583. 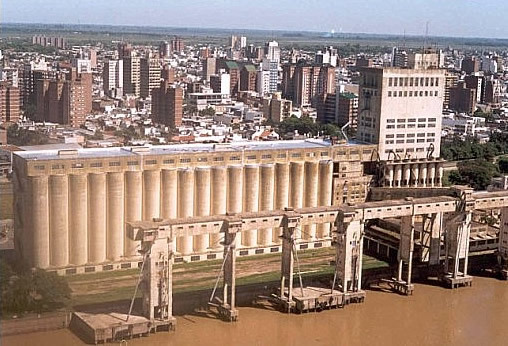 Entrance to the port is via an access channel 6085 m long by 60 m wide with a depth of about 6,70 at datum (zero level of the scale at Santa Fe), to which must be added the actual height of the river above datum at any given time. The height of the river varies throughout the year, being usually, but not always, highest from February to April and lowest from September to October. At all times full details of river heights and depths at passes and in ports can be obtained from the locally published fluvial bulletin (Boletín Fluvial), notwithstanding which, this information should always be carefully checked with pilots. 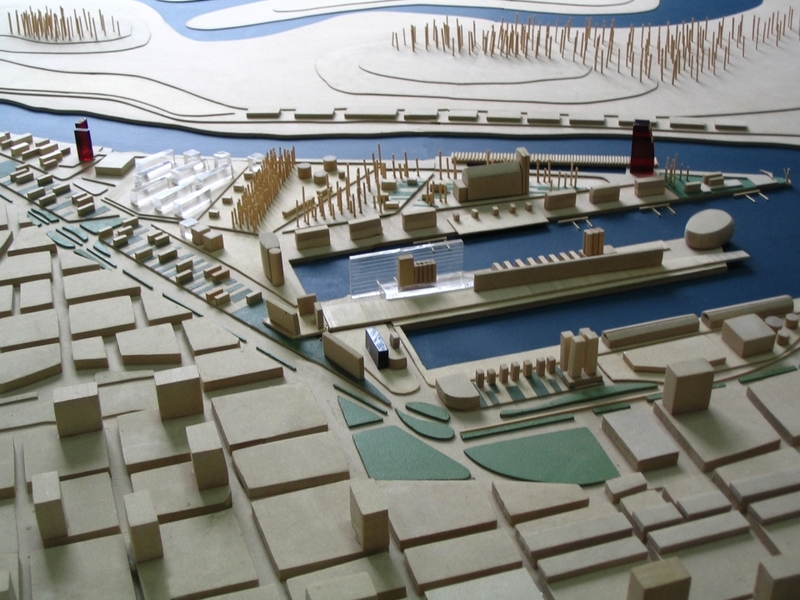 These comprise Basins 1 and 2, The Coastal Wharf, Elevator Nº 1 and the North Derivation Channel. Basins 1 and 2 lie side by side having widths of 120 m and 175 m respectively and being separated by a central quay (east side Nº 1 basin, west side Nº 2 basin) which is about 120 m in width. 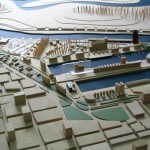 The quay frontage of basin 1 is solid stone whilst at Nº 2 basin the quay is built on wooden pilings only with an open frontage. Dimensions of these basins are: Basin 1, west side 640 m, east side 555 m. Basin Nº2, west side 695 m, east side 883 m.
In disuse. It was suitable for containers and gencargo operations. To date, only small coastal and river boats moor at west side. In disuse. Former grain elevator now converted to hotel and casino. length 400 m, is a continuation of the western side of basin Nº1. 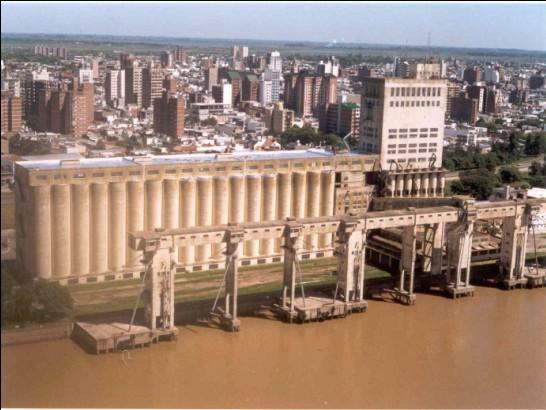 The elevator Nº1 stands on a further continuation of this quay to the south. 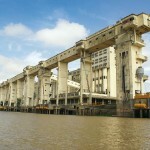 The elevator was built in 1952; storage capacity is 55.000 ton. The berth consist of four interconnected fendered, concrete jetties each 16 m wide with length overall 240 m with outlying bollards on quay. The overhead gallery, supported on 5 towers/5 intermediate supports is 225 m in length and fitted with 8 telescopic chutes, 3 of which can operate simultaneously, being served by 3 conveyor belts at total average loading rate of 900/1000TPH. Maximum clearance of chutes above water level with river at datum is 18,7 m and further deduction must be made for height of river above datum at any given time. 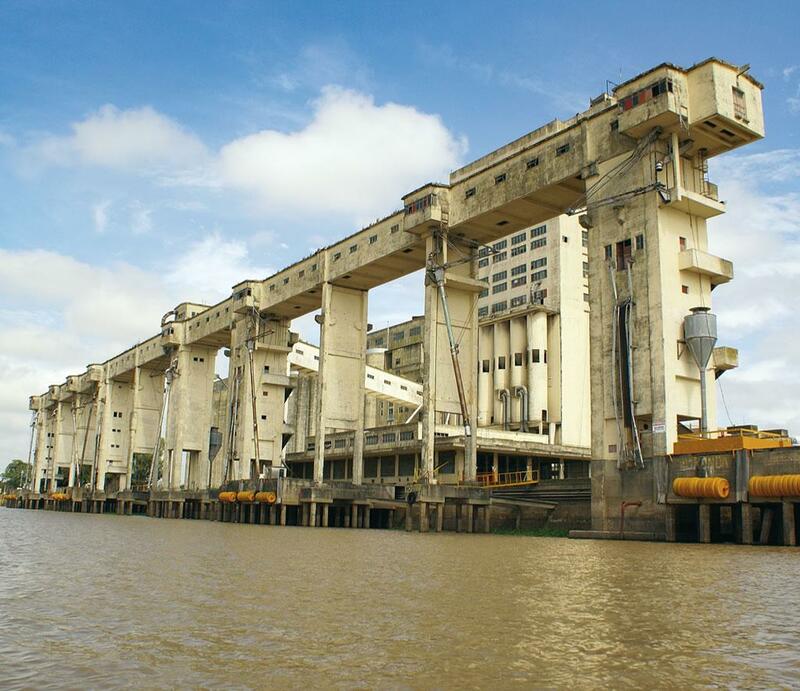 Southward elevator Nº1, one berth abt 120 m frontage handles containers and general cargo from and to Buenos Aires / Montevideo; there are 1 x 250 ton mobile crane, forklifts and 1 transtainer available. This is about 2000 m long and runs just east of Basin 2. 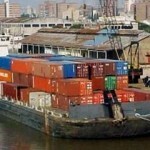 It has open banks and is used by vessels discharging petroleum products at Shell, for local consumption. Sand and pebble barges operate on the west bank. Five sand transporting plants are in the premises. Km 583 Paraná River, maximum 2 vessels. Access channel 6,70 m at datum. To foregoing, height of river at Santa Fe above datum at any given time should be added to obtain actual depth in channel and basins. 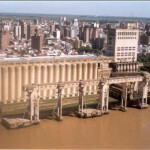 The Paraná river, between Santa Fe and San Martin has been dredged to give a mínimum channel depth of 7,30 m (24ft), which mínimum it should be noted, is in relation to an agreed reference level. Traffic and security messages are attended by the Coastguard via VHF ch #9. Vessels arriving at Santa Fe must call via VHF, ch #9 and #12 from km 520 or before. 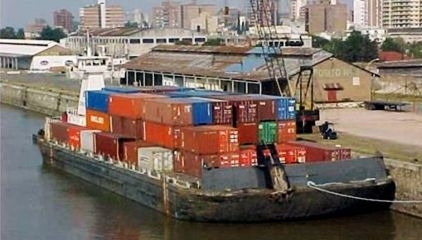 If necessary, port and river pilots may be selected from any of the several private associations serving Santa Fe and the Paraná river with offices in Rosario and Buenos Aires. Available at 2 Provincial and several private clinics. Accommodation available at various hotels. Regular bus services to all important cities including Buenos Aires via Highway Nº9. Domestic airport at Sauce Viejo (22 km) with direct daily flights to Buenos Aires and elsewhere. Delivery by truck. Available with three days notice. Mobile cranes 1×240 , 1×45, 1 trastainer and forklift trucks. Two workshops available for minor repairs.